The continuing status of 'Ladies And Gentlemen, The Fabulous Stains', as a cult movie in the US, has ensured a continued exposure to the delights of what in the UK is a largely unknown area of Steve Jones' & Paul Cook's work. Previously, US punk band Sloppy Seconds covered 'Conned Again' (see Conned Again link on the contents page), now it's the turn of San Diego three-piece Inciting Riots to interpret 'Professionals' (as 'Join The Professionals' is known in the movie). 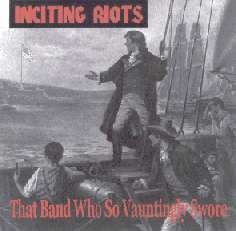 This 6 track EP clocks in at just over 12 minutes, which gives an indication of the pace at which Inciting Riots perform their songs, and 'Professionals' is no exception. It's an uncompromising, valiant performance of the song. Singer/guitarist Ugly Lenny wisely doesn't copy Steve's guitar or singing style, but adapts the song to fit the group's own take on US punk. Dan Skum's drumming is noticeably faster than the original with lightning bass provided by Tim Boyle. Great to see the band sticking to the movie version of the song, with shouts of "Not me, not me, not me!" following the line, "who knows what you're gonna see?" Considering this is a self-financed recording, the production is surprisingly crisp and dynamic. The verdict: I played this loud and thoroughly enjoyed it. It's heartening to see a current group performing the song and giving it their best shot. What about the other five tracks? Sound fine to me. I somehow wonder why the likes of Sum 41 and Blink 182 become massive, while other bands remain on the fringe. The material here is just as valid.